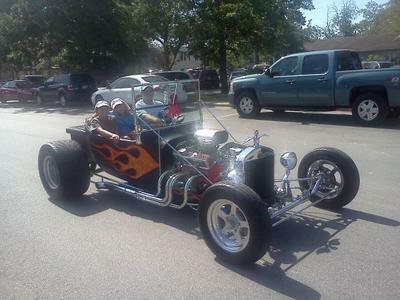 11/23/2012 (Austin, Texas) - 1923 custom built T-Bucket. Car is show quality. Everything bolted to the frame is chrome. Billet Specialty wheels with Mickey Thompson tires. Vortec 350 - 4 bolt main, punched 30 over, pink striped rods. Many extras in motor. 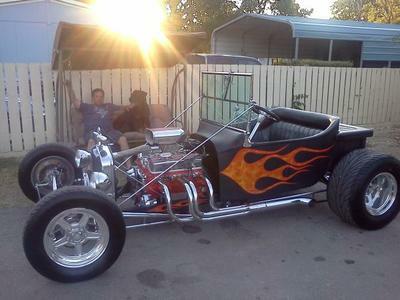 This car has a custom Jaguar chrome rear end (4 link suspension); Wilwood aluminum hubs, axles and brakes. Custom flame paint job. This car is dependable enough to be an everyday driver; has stereo system, air horns, many, many extras. Appraised at $32,000.00. SERIOUS INQUIRIES ONLY. Call Mark #512-227-5243.